So it apparently is beyond the pale for the Federal government to stop maintaining trademarks that are thoroughly offensive to the people that are supposedly honored by the name (at least to team owner Snyder); while satirizing Dan Snyder's agouche attempt to squelch the offensive name controversy by Stephen Colbert by starting the Ching-Chong-Ding-Dong Foundation to Help Asian Americans got the far right hashtag activists to #CancelColbert, because it was offensive but the reference to Native American scalps as your football team is somehow perfectly honorably which is perplexing to say the least. In the case of those that believe any government is too much government then they should be arguing for the disbandment of the Patent and Trademark Office altogether, but instead this real instance of obtuse willful ignorance simply calls for Dan Snyder to stick to his racist team name. If the NFL broadcasters chose to only refer to the team as Washington Football team and used TV magic to cover the logo on the field similar to how they cover part of the field with yellow line for the 1st down, then isn't that within their rights as business owners or does Dan Snyder's racism somehow trump ESPN's desire to retain respectability? 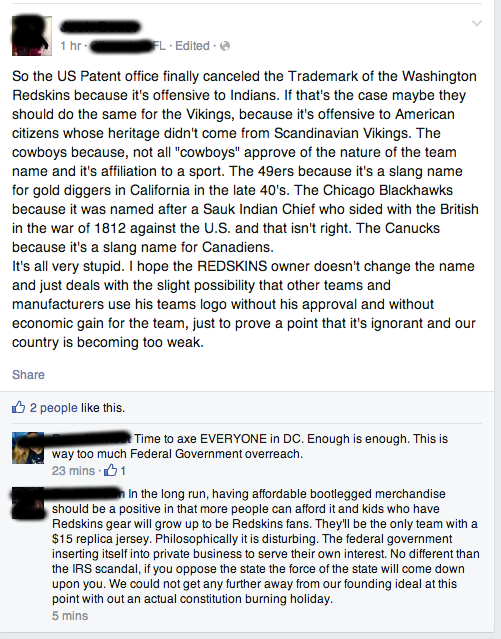 The original post gives a list of other team names that may be offensive to segments of society-- the problem being that names are not offending Vikings, nor non-Vikings, Cowboys nor non-Cowboys, gold diggers nor non-gold diggers, Sauk tribal members nor non-Sauk tribal members, Canadians actual take pride as Canucks the same way Americans take pride as Yankees. Native Americans after being victim of genocide and largest land theft in history get the benefit of the doubt if they say they take offense to the term 'redskins' then it is offensive, because it would fair for them to seek out damages that the American government dealt to their ancestors or even themselves since until the 1970s they were adopting away Native American children to be placed with white families. I like watching football, I played football in highschool, I was present for the incident that caused the removal of highschool mascot to be removed. At the time I thought it was innocuous that the name of the team was plainsmen with a logo from stock clipart showing Native American warrior in profile with a tomahawk (I only know that is was stock clipart because Jamestown, NY's high school mascot was the Red Raiders used the exact same logo) and that Native-American Mr. Stone-Romero took offense to something that had nothing to do with his race. The logo as offensive as I can now see it being, did not hold any special place to the school's teams as it had gradually been phased out in favor of simply being called Shen, and having 'Shen' replace the logo on every uniform. Black face is offensive to African-Americans, they are the ones that determine whether or not they are offended. Jews get to determine whether epitaphs of hooked noses and pais are offensive. Assemblyman Dov Hikind gets to call out being offended that John Galliano wore hasidic costume, but Mr. Hikind doesn't get to determine whether or not wearing blackface was offensive to African-Americans. Dan Snyder doesn't get to chose whether or not the term 'redskin' is beyond the pale, the people that are Native Americans get to be the final arbiter of offense. The central problem is that historical tolerance of racist iconography and memes, are being willful ignored as anything that needs to be corrected. Like telling an 80 year old racist that the n-word is not used in polite conversation, the old racist may react but when I was a kid I said it all the time; offenses that was tolerated in the past are no longer being tolerated. I could be wrong about a lot of things that I currently believe, but that I'm open and if shown reason to change I hope that I would. It is scary that no matter the facts that are presented that there will still be people that will hold on to this antiquated way of thinking. Just to restate the obvious, Native Americans own the term 'redskin' since they earned it with the blood of their ancestors, they are the final arbiters of whether or not it is used by a petty-uber-wealthy-team owner who wants to splash the term around while grown men play a game.